Christophe Weber says a historic push to globalization enlarges the company’s culture. Christophe Weber, the current and still nascent CEO of Takeda, is also an unavoidable symbol of the company’s current transformation into a global organization as the first non- Japanese person to head a Japan-based pharma company. I spoke with Weber by phone with a 17-hour time gap between us — from late evening in my New York hotel room to the following afternoon in his Tokyo office. As I adjusted my equipment and sometimes strained to hear Dr. Weber on the other end, it felt something like the old short-wave communications, simultaneously evoking a sense of vast distance and immediacy. The effect amplified the theme of our exchange; if you want a tangible impression of globalization, try wrapping a conversation around two-thirds of the planet. French-born, in Strasbourg, Weber is a PharmD from a family of physicians, among them his parents and sister. His own interest in medicine led him to earn a doctorate of pharmacy, but he soon discovered he had more of a penchant for business than research in pharmaceuticals. He joined GSK in 1991 as a product manager in Australia and stayed with the company most of his career as he took on positions of ever-greater responsibility around the world. 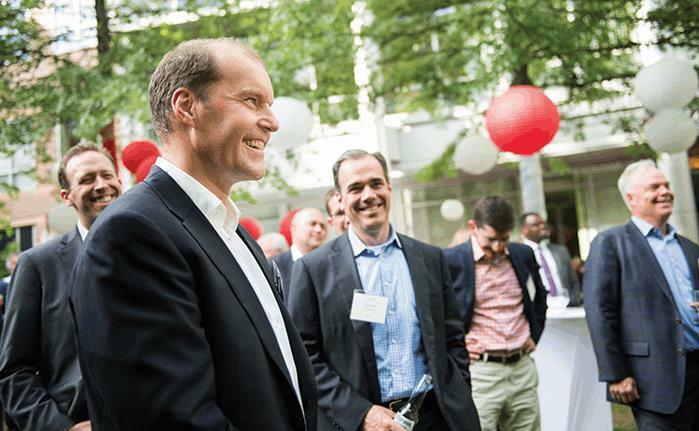 His last position at GSK was head of its vaccine business, virtually the CEO of a fully integrated organization. To say the current initiative by Takeda is a leap forward in globalization is not to ignore its previous global intentions or its global leadership among Japanese companies. Takeda was the first company in Japan to form a U.S. joint venture — with Abbott, TAP Pharmaceuticals, later integrated into Takeda. It similarly absorbed Millennium, acquired in 2008, and Nycomed, acquired in 2011. And in many other ways, Takeda led the pack of home companies in growth initiatives outside of Japan. Weber’s job is to build on previous moves to make Takeda more independent of its home market and to remake the company as global in culture as well as strategy and organization. As he notes, 10 years ago, Japan held about 20 percent of the global pharmaceutical market; now its share is down to less than half of that. Like most other pharma companies in Japan, the industry faces even further setbacks in its home market as Japan recovers from a cluster of natural and technical disasters, deals with a sluggish economy, and places ever more restrictive policies on industry revenue and profits. Like other companies inside or outside of Japan, Takeda has also found it a challenge to integrate its large acquisitions, and it sees globalization as the only way to do so. One of the largest effects of the mergers was geographic, increasing the company’s presence in 70 countries. “I came at the time when it had become necessary to organize the company into a fully global company, integrate all of the different businesses and functions, and move to the next page,” Weber says. Company culture was his first priority, as it remains, and to begin moving the culture toward a more global state, he turned to listening as his primary tool. Weber spent the first few months understanding the dichotomy of tradition and transformation at work in the company. “On one side, the company’s culture is very strong because it was established in 1781, so there is a very long foundation,” he says. “But on the other side, the culture is really new because of these acquisitions. Seventy percent of Takeda’s employees are outside of Japan, and they are very new to the company. So we had to create a common picture, building on the blended history and traditions of the company.” Besides increasing geographic spread, the mergers also greatly expanded its worker base — in one case, the number of employees doubled. “Each time the company would make a merger, always with a company outside of Japan, it was a cultural shock,” he says. Takeda’s master strategy for the next 10 years is to achieve industry leadership in three therapeutic areas where it sees its strongest global assets: gastroenterology, oncology, and CNS, plus specialty cardiovascular and an initiative in vaccines. According to Weber, the company’s selection of those areas reflects where it has the greatest strengths on both the R&D and commercial sides of its global organization. GI and oncology promise to be the biggest drivers of Takeda’s business, he says, showing an awareness of the challenge and risk, as well as the potential for drug development in those areas. But accountability must balance agility, Weber adds. Here, the Japanese tradition of near-perfect diligence may serve the company well; that is, if the organization can keep moving at optimum speed. This will be one area of Takeda to monitor over time, as the first-ever challenge by a Japan-based company gone global: Will its decision making and implementation tend toward a more traditional pace as it holds its operations to high ethical and technical standards, or will it find a way to have accountability and nimbleness, too? Nothing in Takeda seems to have changed more than its top management. Although the Japanese board and chairman, Yasuchika Hasegawa, remains in place, the corporate executive team has become quite varied on Weber’s watch. More than half of the Takeda executive team members have joined the company, and almost everyone has a new job, since his arrival. The executive team contains seven different nationalities, and more than half of the team resides outside of Japan. One-third of the team is U.S.- based, including the head of research, Dr. Andrew Plump, and the head of oncology, Dr. Christophe Bianchi, both in Boston. Global goals require world-class performance as a business. One immediate challenge the team will have to face together is the company’s legacy of relatively low profits and genericeroded sales. Takeda has already shown its commitment to cutting costs with manufacturing consolidation and plant closures, cash-flow management, and other measures, but Weber emphasizes its other main approach to boosting profitability: increasing the top line. How? By doing something it had not usually done before — launch its own new, innovative products, globally. Considering Weber’s statement on innovation, people who chiefly focus on company ledgers will notice a seemingly contradictory downturn in Takeda’s 2016 R&D spending. He explains the drop as a temporary one caused by the “pipeline evolution,” with a swell of later-stage products requiring more conservative early-stage investment. Takeda also has created a single manufacturing organization for the first time. It previously had four separate organizations, independent of each other. “We have closed a few sites that unfortunately we couldn’t keep, but at the same time we just bought a site in Minnesota to produce biologics so this is an ongoing situation to optimize our network,” says Weber. He says the company is open-minded about outsourcing, which it does on a case-by-case basis, factoring in market proximity, efficiency, and risk. For strategic products, the company employs dual sourcing, often combining insourcing and outsourcing. Takeda has traditionally used outsourcing partners extensively in its clinical trial operations and continues to do so. A company that has existed for 235 years will have traditions that endure along with the ones that fall behind the times. And sometimes, during historic shifts, it becomes necessary for a company to define its values in new terms. Weber recounts how Takeda greeted the 21st century by declaring “Takeda-isms,” or aphorisms that translate into English as integrity, honesty, fairness, and perseverance. Considering the range of pricing practices among companies in the biopharma industry, Takeda’s approach may stand as a model for those that wish to avoid the extremes. Subjective, human-level responses play a central role alongside attained wisdom in the tradition of the great Japanese poets — a traditional principle, perhaps, but one with universal, global appeal. It’s not about IT — it’s about culture. New digital technologies and applications change how people obtain medical care, how doctors and patients relate, how biopharma companies interact with customers and regulators, and how a fast-grown company such as Takeda undergoes a sweeping transformation and stiches together its global organization. Bruno Villetelle, Takeda’s chief digital officer, thinks big. With a newly created title to fit his job, Villetelle has the charge to explore every avenue where digital technologies may improve Takeda’s business and operations. Taking the democratic approach to digitization is also key to fulfilling the “33,000-person startup” of President and CEO Christophe Weber, says Villetelle. “The digital space is entrepreneurial; it is fueled and inspired by what startups are doing. So we are trying to disseminate this startup spirit in our organization. We are encouraging and educating our people, whether they are on the field or in our research centers, to see the importance of digital tools and to work through barriers that some people might have with the new technologies — and then to come up with their own ideas and suggestions for applying the tools in their area of work.” Like potential partners, employees can even submit their ideas to the company’s VC fund, which vets the suggestions and selects some of them for further testing and, if results are positive, scale-up to wider application in the company. Separate tracks handle incremental and “exponential” changes, Villetelle says. As the executive VP of corporate development, the responsibilities of Jocelyn Trokenheim concentrate mainly on global mergers and acquisitions (M&As) and business development. Her work focuses chiefly on the company’s three main therapeutic areas: oncology, gastrointestinal, and central nervous system. She also oversees academic research collaborations from very early discovery all the way to late-stage compounds or commercial products. Were your position and responsibility created as a result of Takeda’s globalization or has it always existed but perhaps had a different agenda? TROKENHEIM: The position has existed before, but the corporate development role now reinforces the company’s current focus on continuing the transformation and driving growth through external opportunities. What are some of the transactions you have done since you arrived last April? Actually, the biggest was the divestment of our respiratory portfolio, which we completed just before the holidays last December. The whole objective was to help Takeda focus on our current areas. Divesting the entire respiratory portfolio will help us optimize our resources to focus on those three key areas. There were also a few recent GI-related deals, one with enGene Research Laboratories, a gene therapy company, at an extremely early stage. It is a research collaboration; we will support the development, the clinical design, and other related activities. Gene Therapy Is Challenging. Would You Say It Is Risky? It is difficult, but it is the kind of innovation in which Takeda would like to be involved and contribute to. We see its potential as high science and its innovative nature in how it could help the patients down the road, and so we’re very interested in that. So, is that part of the globalization — to expand how you do discovery and perhaps take on more risk in certain areas? Yes, the way we’re trying to globally transform Takeda is to focus on our resources, corporate strategy, and corporate direction, and, we are very open to exploring anything that fits within that framework. What does that mean culturally for the company? I’ve been with the company for 13 years now, and I’ve seen a lot of changes, not just from a business perspective but from a cultural perspective. Christophe Weber being the first non-Japanese person to lead Takeda has been very positive. I believe people feel very positive and energized by the sharp focus and energy he has brought in.